Will MIddlebrooks has been off to a hot start – but what’s going to happen when Kevin Youkilis returns from the DL? 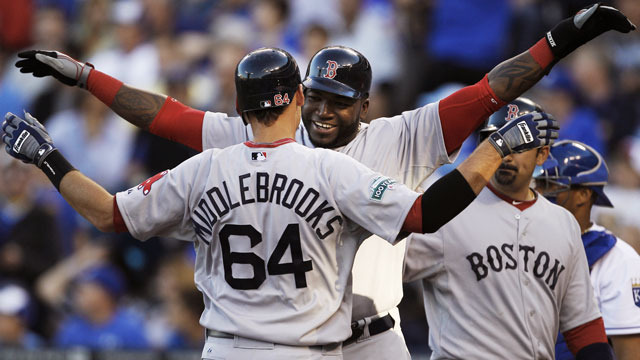 Middlebrooks’ hot start will push The King of Walks to be the King of mashing the ball more. LIVINGSTONE McGILLIGAN: Will Middlebrooks could be hitting .400 when Kevin Youkilis comes of the disabled list and I’m not sure that would be enough to keep him at third base for the Boston Red Sox. Middlebrooks isn’t simply up against the incumbent at Fenway’s hot corner; he’s competing with a member of New England royalty. 1. Any member of the Kennedy family. Youkilis is elevated slightly above the average Red Sox player because he married Tom Brady’s sister. This essentially makes him an honorary Kennedy. In addition to this, Youkilis has been one of the most consistent hitters in Major League Baseball for several years. However, injuries have limited him the past two season and 2011 was the first time he hit under .280 since 2007. Add to this the rocky start with manager Bobby Valentine – for the record, completely Bobby V’s fault – and Youkilis seems to be in decline. Middlebrooks success since his call up has been a bright spot in an otherwise terrible start to the season for the Red Sox. Middlebrooks is hitting .409 with seven extra-base hits and nine RBIs in four games. According to boston.com, Middlebrooks is the first player since Enos Slaughter in 1938 to have at least one extra-base hit in each of his first five games in the majors. However, he’s not without some injury concerns of his own. Middlebrooks was taken out of Tuesday’s game in the second inning after feeling some tightness in his left hamstring. It’s the second time since his call up he’s been taken out of a game because of the issue. Once Youkilis returns from the DL, Valentine will have to decide between the two. Given Youkilis history, it’s hard to imagine him not being reinserted into the lineup. The only way this doesn’t happen is if Middlebrooks marries a Kennedy in the next week and helps the Celtics win a playoff game. The only way for Youk to top that is to announce he and Brady’s sister are having a boy and Belichik declares he’s going to trade up to get him in the first-round to be Tom’s eventual replacement. A few weeks ago I wrote about how the Red Sox season had a chance to turn around because of the Ben Affleck Movie Release Date Theory. Essentially, any time Affleck has a movie released in October, the Sox win the World Series. Well the trailer for Argo is out with Affleck directing and starring. The movie is set for an October release. In Ben, Red Sox Nation trusts.